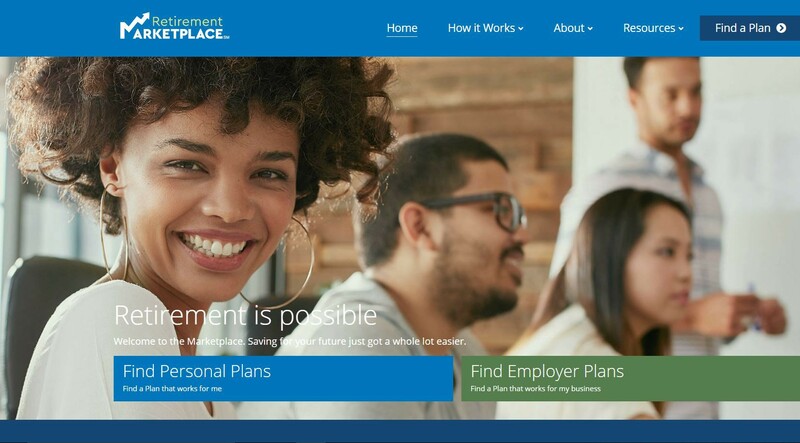 The newly launched Retirement Marketplace website, shown above, helps small businesses and individuals find low-cost retirement savings plans. The marketplace was created to help approximately 2 million Washingtonians who do not have access to retirement savings plans through the workplace. An estimated 55 million Americans lack access to a retirement savings plan at work, and 29 percent of U.S. households with people 55 and older have no retirement savings at all. To help more people save for retirement, the Washington State Department of Commerce this week announced the nation’s first online portal where businesses and individuals can comparison shop for low-cost, state-verified retirement plans. The Retirement Marketplace was created to help approximately 2 million Washingtonians who do not have access to retirement savings plans through the workplace. Anyone can use the Retirement Marketplace to learn more about how to make the most of saving for the future. The website offers unique shopping pathways for businesses and individuals — including self-employed, part-time and temporary “gig” workers and people with traditional jobs. “Access to affordable retirement savings plans should be available to everyone, especially small businesses and workers in today’s gig economy. I am proud that Washington is leading the way with the nation’s first voluntary, online Retirement Marketplace,” Gov. Jay Inslee said. The marketplace is part of the Inslee administration’s goal to improve financial security for all Washingtonians, and it was one of the ideas generated by the Governor’s Aging Summit in 2013. Other state efforts to improve financial security for residents include the Asset Building Program, access to mainstream checking and savings accounts, the Earned Income Tax Credit for people who earn low-to-moderate incomes, financial education resources for youth and adults, consumer protections and education through the Department of Financial Institutions, and a new paid family and medical leave program that takes effect in 2020. Cannot charge enrollees more than 1 percent in total annual administrative fees. Doug Shadel, director of AARP for Washington state, said the marketplace can help older adults catch up on saving for retirement.